For adoption fees and more information about our adoption policies, and to complete an adoption application, please go to our website, purrpartners.org. What a beauty this girl is. She has such a beautiful face. Like her sister - I think she knows that she is beautiful. 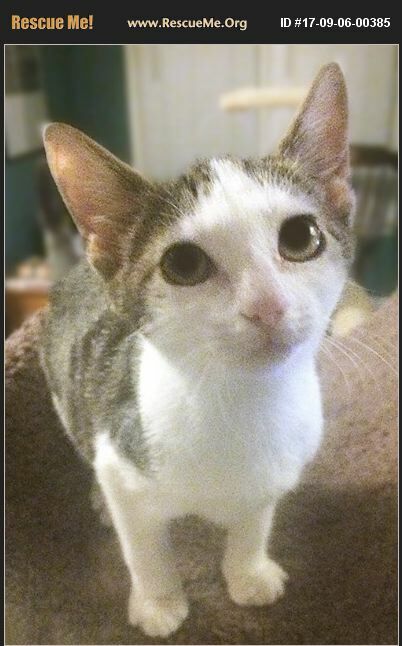 She has very expressive eyes that beg you to pick her up and love her. This girl is very curious and has inspected every inch of the kitty romper room she lives in. When you walk into the room, you will see her head pop up just before she runs to greet you. She and her littermates had a tough start in life. Purr Partners got them from a shelter after they were dropped off without their mom. They had to be bottle fed for a few weeks, but as you can see they have responded well to the love and care they have received. Like her littermates, she enjoys toys of all kinds, cat trees and hanging out with humans. You can't go wrong with this girl! !